If suffering from watery eyes, a congested nose and itchy throat wasn't bad enough the facial irritation from your symptoms can compound the problem. 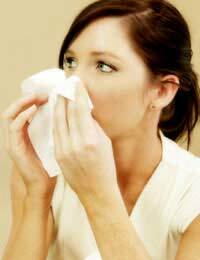 Constant nose blowing and eye rubbing can also worsen the discomfort, leaving your entire face sore and red. On top of that, the social effects can be devastating and may leave people missing work days for fear that their appearance will alert the world to their hay fever. Fortunately, there are some tips to help you prevent excessive facial irritation and also, to soothe and disguise any irritation that does occur. The best way to avoid the facial irritation that occurs from hay fever is to adopt prevention strategies to minimise hay fever symptoms. Following on that, you can use various drug treatments, such as anti-inflammatory drugs and antihistamines to reduce your symptoms. If you are frequently blowing your nose, something as seemingly simple as the type of tissue you use could affect how much irritation occurs. Always keep a box of tissues handy at work or school and don't use toilet paper to blow your nose, as this is an easily way to irritate the already tender tissues around your nose. Effective staples that are simple, cheap and easy to use include cucumber slices on your eyes. You can also try cooling face masques to ease the burning and redness your skin may experience. In addition, try applying cold, wet tea bags to the eyes; the caffeine will help to reduce redness and the cold teabag will feel soothing. Men may be a bit wary of such products but they do help to ease irritation and many lines of facial products now have ones specifically for men. Look for cooling, calming ingredients such as chamomile. Many eye creams are specifically formulated to refresh the eyes-look for a gel formula and dab it around your eyes each morning before applying makeup. Some people find relief by mixing a few drops of a diluted essential oil into their facial moisturiser. The right essential oils can soothe and relax the skin and simultaneously clear congested nasal passages. Lavender, peppermint and tea tree oils are excellent ones but be sure you don't use pure essential oils-they must first be diluted in a carrier oil such as almond oil. For women-when all else fails, a small amount of makeup can help to disguise redness in the facial area. Over-the-counter eye treatments can help to reduce the bloodshot appearance of your eyes. As difficult as it may seem, do try not to rub your eyes frequently, as this will only increase the irritation. Dot a concealer lightly under the eye area and over the lid, up to the brow bone. Pat it in gently, so as not to further irritate the delicate skin around the eyes. You can set the concealer with a loose powder. Avoid shimmery eye shadows, which will only draw attention to irritated skin around the eyes. Using a white eyeliner pencil, apply a bit to the inner corner of each eye and smudge-this will give your eyes a more alert appearance. A brown/black or navy mascara is the finishing touch and can give the illusion of brighter eyes. Black mascaras are more likely to cast a shadow under the eye so avoid their use when your eyes are irritated from hay fever symptoms. Hay fever symptoms can be overwhelming and may leave you embarrassed to face the world with your red eyes, irritated skin and runny nose. Once you have incorporated a preventative treatment plan into your lifestyle, you can address the facial irritation that may occur at times when symptoms still peak. With soothing skin products, eye drops, natural home remedies and a bit of makeup as needed, your skin will feel soothed and less irritated. Nobody need notice the facial signs of your hay fever and instead, can focus on your smile.